Twenty-six years ago, my wife, Mimi, and I took a six-week honeymoon that included camping and hiking. During one hike, she asked me to sing. So, I sang and was flattered that she appreciated my voice. I found out later that it had nothing to do with appreciating my voice. She wanted me to sing to scare the bears away! It must have worked. We didn’t have any scary encounters with bears. And, yes, we’re still happily married. 1. Carry bear bells. That’s right. I spelled it correctly. It’s not barbells. It’s bear bells. These noisemakers can take a number of forms: noisy bells hanging from your belt or rocks in a can are two that I know of. The idea here is to warn bears of your approach. Most will get out of your way if warned. 2. Talk loudly. Most bears are not interested in humans unless they have been habituated to them by being fed human food or by being invited to dinner with improper food handling. When they hear humans talking, they simply saunter off with disdain. 3. Buy and take along bear bangers. These extreme noisemakers are not designed to warn bears ahead of time of your approach, but to scare them off if you have an actual face-to-face encounter. Here is a website that that gives a good description of how they work. Check out this Youtube demonstration of this device. Here is another website where you can buy them online. 4. Carry an air horn. You know the kind you often hear annoyingly at graduations. You can buy them at a marine supply store. 5. Carry pepper spray. This is the method I recommend the most highly. Many experts agree that pepper spray is an effective bear deterrent. You’ll find this product online and in your favorite outdoor outfitter store. Also strongly consider buying a holster or belt clip for your pepper spray canister. It won’t do any good in a sudden emergency if you don’t have it handy. Just make sure you don’t spray into the wind, or you may be the one blinded and not the bear. 6. Take a big tent. That is big enough that you can put your backpack and other equipment between you and the walls for added protection. 7. Include in your backpack proper equipment for stashing your food where bears can’t get at it. This includes rope or parachute cord and an effective bear bag. 8. Use a bear-proof canister. You can buy them online or at an outfitter like REI. 9. Hike with companions. Talk your friends into going with you. The more people you take along with you, the less chance there is that a bear will attack. Being in a group when in bear country is probably one of the best forms of insurance against bear attacks. Here are two things to leave at home. Firearms. 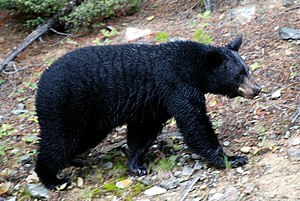 Any firearm that is light enough for a backpacker to carry is too light to kill a bear. Even if your weapon killed the bear, the dying animal could badly maul you before it expired. More likely, your shot would injure the bear and just make it mad. There are few things more dangerous than an injured bear. 2. Pets. Dogs especially are natural enemies of bears. If you take a pet with you to the wilderness, and it is running loose, it may come running straight into your arms with an angry bear on its tail. I’m not advocating that you never hike with your dog. But, just think twice about it if you are heading into bear country. Always keep your dog on a leash. Don’t shy away from hiking where bears are known to live. If you did, there would be few places in North America where you could take a hike or go backpacking. Another thing to consider is that bear attacks on humans are very rare. Just look over the suggestions I have provided above, do some more investigation and choose your best method of scaring off bears. You might try singing. I know that one works. Congratulations with your marriage. Anyway, I had encountered one bear before and I was so frightened because I totally don't know how to handle it. Good thing someone helped me get rid of the bear. What I learned from that experience was to never make a big move or else the bear will attack you and consider you as a treat. Well, my wife is a singer so that should come in really handy :) I didn't know bears hate noise but at least, now I know. This post is really enlightening since I knew bears to be ferocious and somewhat violent in a sense that it attacks but reading your post, they will really not bother you if you leave them alone and if you warn them of your approach. Really an educational post.